A light pollution vs. melatonin summary: Researchers are concerned that certain health problems can be caused by a long term suppression of our naturally and nightly occurring hormone melatonin. This hormone, made by the pineal gland under our brains, is only secreted when it is dark. It regulates our circadian sleep/wake cycles and other hormonal glands and offers us antioxidant protections. While there are different factors that can prevent the pineal gland from making melatonin, such as its calcification due to old age, this web page has been following the particular factor on the gland by light pollution at night. Researchers are finding that exposure to bright nocturnal light decreases the human body's production of melatonin. A decrease in melatonin production has been linked to higher rates of certian cancers, such as breast cancer in women and prostate cancer in men. A bit more details on these steps follows. Light prevents the production of melatonin through primitive ganglion cells in our eye's retinas, two percent of which, we have recently learned, are photosensitive. These photosensitive ganglion cells are activated at or have a peak sensitivity to particular blue wavelengths which does not match the same peak sensitivities of the retinal scotopic rod cells or blue sensitive cone color cells. Rod and cone cells are the same retinal cells which you may remember learning about in biology class. While certain cones and rods can see some of this same spectral region, they just don't react to it as strongly as these particular ganglion cells do or in the same timeframe. So it is blue light, such as that of the blue daytime skies, that triggers these ganglion cells. This makes blue light human's zietgeber (or our natural and external time-giver cue). These cells send their signals on to our brain's suprachiasmatic nuclei (SCN), which is a small collection of brain cells in our hypothalamus and is the home of our main circadian system or our biological clocks. The SCN turns off the pineal gland , a small endocrine organ that lies just under our brains. However, when it is dark, the ganglion cells should not detect blue light, so the SCN allows the pineal gland produce its hormone melatonin. This melatonin is the chemical message that is released to our body in the blood which causes/activates certain health inducing activities. Once in the blood, melatonin can not only suppress cancer cell growth or even cause cancer cell death, it also reaches other hormone producing glands, such as the ovaries and the pituitary gland, and stops the production of their hormones. The hormones that come from these glands: estrogen, progesterone, follicle stimulating hormone (F.S.H. ), and the lutenizing hormone (L.H. ), can cause rapid breast tissue cell replication. It is the cellular replication and turnover that increases the risk of transcription (or genetic copying ) errors to occur in their genetic coding. Such copying errors can lead to cancer. Ever greater growth and turnover means more frequent chances for coding errors, and so, greater chances of cancer. Also, melatonin has been found to absorb a free radicals, such as hydroxyl ( OH ), ionized oxygen molecule ( O2- ), and nitric oxide ( NO ). Free radicals are generated by ionizing radiation and are is estimated to cause almost 70% of biological damage to DNA, proteins, and cellular membranes, the hydroxyl radical most especially. While there are antioxidants that can clean these oxidized radicals up, many of them do not do so permanently. They can release the radical and recapture it and release it and ... (called redox cycling ) back into the body to cause damage again, for example vitamin C. However, melatonin, once oxidized by such a radical, terminally breaks apart, but does not release the radical. Its pieces apparently can also consume more free radical, in fact, a single melatonin molecule can consume up to ten free radical molecule species! Melatonin is involved in circadian rhythm regulation, sleep, hormonal expression of darkness, seasonal reproduction, retinal physiology, antioxidant free-radical scavenging, cardiovascular regulation, immune activity, cancer control, and lipid and glucose metabolism. It is also a new member of an expanding group of regulatory factors that control cell proliferation and loss and is the only known chronobiotic hormonal regulator of neoplastic cell growth. At physiological concentrations, melatonin suppresses cell growth and multiplication and inhibits cancer cell proliferation in vitro through specific cell-cycle effects. At pharmacological concentrations, melatonin suppresses cancer cell growth and multiplication. At physiological and pharmacological concentrations, melatonin acts as a differentiating agent in some cancer cells and lowers their invasive and metastatic status by altering adhesion molecules and maintaining gapjunction intercellular communication. In other cancer cell types, melatonin, alone or with other agents, induces programmed cell death. Source: Lancet, Oct 14th 1978, Vol. 2, pages 814-816. Diminished functions of the pineal gland depress its melatonin production. Depressed melatonin production allows for ovarian growth and greater hormonal production. Greater hormonal production leads to earlier sexual maturation, early puberty and greater breast cancer development. The authors looked at the evidence of pineal calcification (p.c.). This means that the pineal gland near the brain becomes heavier due to an increased concentration of calcium in it. P.c. naturally occurs as all populations age, but at very dissimilar rates. Their paper focused on answering why this is so and some other aspects of p.c. Were the rate differences due to differences in breast cancer disease in the population, or, as they argued, did it CAUSE the breast cancer differences? P.c. was measured using skull x-rays. They also cited evidence that transplanted tumors to pinealectomized animals grew larger and became more malignant compared to control groups and giving them melatonin could abolish the damage. Pinealectomy is, in effect, the removal of the pineal gland. While this could be achieved via surgery, as it eventually occurs during increased p.c. It is also easy to achieve by subjecting the animal to continuous, 24 hour light. The light, just like the increased calcification, shuts off the pineal gland's production of melatonin, as the gland naturally only operates in the dark. Melatonin inhibits the ovarian glands from increasing in size and so limits their production of hormones, such as oestrogen, progesterone, FSH and LH. These hormones increase the rate of cellular growth in the breast, leading to greater chances of genetic error and thus breast cancer. 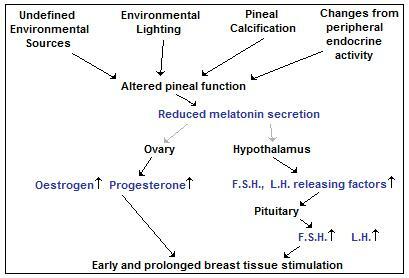 The hypothesis that diminished function of the pineal gland may promote the development of breast cancer in human beings is suggested by the relation between breast cancer and prolonged oestrogen excess, and by the observation that the pineal secretion, melatonin, inhibits ovarian oestrogen production, pituitary gonadotrophin production, and sexual development and maturation. Incidences of p.c. & of breast cancer are moderate among black populations in the U.S. Impaired pineal secretion is believed to be an important factor in triggering puberty, which is a risk factor in breast cancer. Changes in feedback hormones by peripheral endocrine secretions. They sum up by writing that: Our hypothesis also suggests that melatonin, by suppression of oestrogen secretion, or by direct inhibitory effects on breast tissue, might suppress induction of breast cancer. Two letters responded to the Cohen, Lippman & Chabner paper in the Lancet Nov. 4th journal of that year. Source: Lancet, Nov 4th 1978, Vol. 2, pages 1001-1002. The first letter was by E. Tapp. Tapp, citing five papers, argued about the use of radiology in the detection of p.c., saying that the detected calcification was due to individual areas of calcification in the pineal gland and not of the entire gland. He wrote that calcification was constant throughout life and did not increase with age. So he discounted the radiological evidence linking breast cancer patients with increased p.c., thus came to the conclusion that the reverse was true. He stated that dying cancer patient's pineal glands were heavier than those dying of other diseases. He then talks about states that melatonin increases prolactin secretion and that is implicated in the development of breast cancer. He said that inducing breast tumors in rats had an increased malignancy if melatonin is given, just as there is an increased malignancy if prolactin is given. He then said that Hamilton found that continuous daylight, which should suppress the pineal gland, resulted in shrinkage in the incidence and malignancy of the tumors. He promised to present further melatonin level data in breast cancer patient showing this later on. Note, I have not found Tapp's additional promised evidence. Nor am I currently able to produce the Hamilton paper (Hamilton, T., Br. J. Surg., 1969, v56, p764), but will review it when I can later on. Source: Lancet, Nov 4th 1978, Vol. 2, p 1002. The next letter was by Rashida Karmali1 and by D. F. Horrobin2 and T. Ghayur2. Their preliminary results confirmed what Cohen, Lippman and Chabner said. They found that melatonin inhibits tumor growth in rats with an intact pineal gland. The data result is based on 1 mg of melatonin / day on the growth of a mammary tumor that was transplanted into a rat. They also pointed out that the protective action of chlorpromazine may be two fold, 1.) in that it raises melatonin levels, which inhibits estrogen levels, and 2.) it raises prolactin levels as well, which inhibits growth in some animal tumors. So in the case of chlorpromazine, the effect of melatonin could just be suppressing estrogen levels and no more. They do finish their letter pointing out that melatonin stimulates a thromboxane A2-like substance in rats, and that their preliminary work suggests that an error in the thromboxane A2 synthesis leads to tumor growth, but those agents (i.e. melatonin) that stimulate the thromboxane creation significantly inhibits tumor growth. Source: Lancet, Dec 23rd & 30th, 1978, Vol. 2, p 1381-2. Cohen, Lippman and Chabner responded by first saying that radiology is an insensitive way to study pineal calcification, that there is a definite correlation between the degree of calcification and the detectability of pineal calcification on skull X-rays. They mention an earlier work of Tapp and Huxley that showed the pineal calcification increased with the age of the female between ages 14 to 59, which matches what the X-rays showed. Pineal glands of dying cancer patients are heavier than those dying of other diseases for the increased calcification could account for the higher weight. They stated that this increase in pineal activity and pineal hypertrophy could be caused by the metastatic cancer, leading to increased pineal weight. Then the secondary hypersecretion of melatonin would be a possible reaction to the metastatic cancer. They stated that Tapp incorrectly mentioned Hamilton's work. It was that he showed that animals intubated with dimethylbenzanthracene (DMBA) and kept in continuous light (which would decrease melatonin secretion) as opposed to the controls in diurnal (day/night) lighting had a higher incidence of tumors, but that those tumors were less malignant in their histopathological appearance. They stated that Most published works supports the view that melatonin inhibits tumor induction, growth, and metastasis, as we said in our paper Oct 14. They express interest in the above "letter of Dr. Karmali and colleagues (Nov. 4. p 1001) which supports this contention and gives, for the first time, published evidence of such effect on breast cancer." Please note that you should be able to use the links to the original papers for those now discussed below. Source Link: Cancer Research, August 1984, Vol. 44, No. 8, p3403-3407. Exposure of female Holtzman rats to constant light (24 hr/day) immediately after birth significantly increased 9,10-dimethyl-1,2-benzanthracene-induced mammary cancer. Administration of melatonin (500 μg/day/rat i.p. given from 52 to 145 days of age) completely abolished the effect of the functional pinealectomy by sharply reducing 9,10-dimethyl-1,2-benzanthracene-induced cancer incidence from 95% to 25% during the post-9,10-dimethyl-1,2-benzanthracene observation period which lasted up to 180 days. 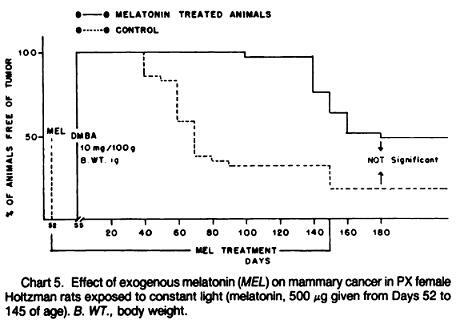 On the other hand, administration of melatonin to surgically pinealectomized animals (labeled PX rats) exposed to constant light reversed the effect only partially by reducing the cancer incidence from 83% to 53%. 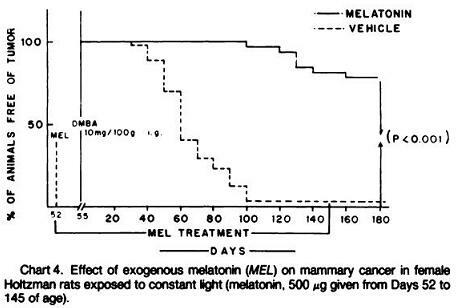 Further, melatonin treatment in intact and surgically pinealectomized animals exposed to a short photoperiod revealed qualitatively similar differences in suppression of the cancer incidence. From these results, it is concluded that, to have an impressive antitumor effect, presence of the pineal gland is essential, and the probable site of melatonin action appears to be at both the pineal gland and the hypothalamus. To study the effect of melatonin on mammary tumorigenesis, a classical endocrinological maneuver is used in this study by exposing female rats to constant light immediately after birth. In such "functionally pinealectomized" young virgin rats, melatonin deprivation removes its inhibitory regulatory control over the hypothalamic-hypophysial axis leading to constant availability of estrogen and elevated circulating PRL. In response to these changes in the hormonal profile, there occurs premature sexual maturation, prolonged estrus, and prolonged mammary gland stimulation. This is what the authors conclude in their abstract. A continuous exposure to light, should in effect, pinealectomizes the animal, which in turn, should fail to protect the animal from breast cancer. So then, a continuous exposure to light should be avoided if one wants to avoid the cancer. To learn more the effects light pollution has on plants and animals of many different kinds, please visit our Light Pollution vs. Nature pages. If you can see your hand in front of your face at night in the dark when you go to sleep, it is too bright! That's right, NO nightlights, television, nor hall lights should be left on. Windows need to curtained against intrusive outdoor light pollution sources. Clocks with their self-luminous faces, should at least glow red or use red L.E.D.s. If you think that is extreme, then follow this link to a study of blind women in Finland. 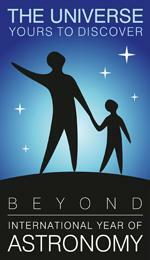 Another study is particularly interesting from an astronomer's point of view. Red light, or those of longer wavelengths, are routinely used to function in the dark, check sky charts, record notes, and such when going out to observe at night. Red light is used because shorter wavelengths, such as the blue end of the spectrum, have more energy and can break down rhodopsin in the eyes. Rhodopsin is what our bodies make from the vitamin A rich foods we eat, like carrots. We need it and use it so our eyes can adjust to the dark, low level light conditions. This is called our "night vision". It is what we use to see very faint objects in the sky like galaxies or comets. What a blue sky means to us -- Go out during the day time and look up at the blue sky. Intuitively, we know that a blue sky means that it is daytime, as it has been so for millions of years now. Our brains know it. Our bodies know it. Our hormones know it. The suprachiasmatic nuclei (SCN), the center of our circadian system, knows it and responds to it. The SCN controls the pineal gland, which outputs the hormone melatonin to control the rest of our bodies. In fact, it is very the presence of the blue light that tells the SCN that it is daytime. And so, in the presence of blue light, the SCN, assuming it is daytime, acts accordingly. In the presence of blue light, the SCN acts as if it is daytime, even if it is the middle of the night. We have just recently learned that there are some photoreceptive cells in our eyes that are not rods or cones, but do detect blue light and transmit that information to our suprachiasmatic nuclei. When we see this blue light, our pineal gland outputs as if it is daytime, and so then it does not create the necessary melatonin for our bodies, when we may need it. For thousands upon thousands of generations we were hunter-gatherers, out in the daylight and exposed to that blue sky. Since about a century ago, when Edison and others developed electric lighting, we've become [a] predominantly indoor-dwelling species. We've been removed from our natural stimulus. -- Neurologist George Brainard, Ph.D.
Director of the Light Research Program at Thomas Jefferson University, in Philadelphia. This next paper considered the claims of melatonin's benefits of some other studies to wonder if something more basic and fundamental was the real reason for the other's findings. And it seems to be very fundamental, indeed. Source Link: Formerly referenced as "Endocrine Journal, 1993, Vol 1, Issue 4, pages 57-60". However, that journal was renamed to Endocrine at its second year. Tan, Dun-Xian; Chen, Li-Dun; Poeggeler, Burkhard; Manchester, Lucien C.; Reiter, Russel J. Department of Cellular and Structural Biology, Univ. of Texas Health Science Center at San Antonio, San Antonio, Texas. The hormone melatonin has been found in the same form in many different organisms, from algea to humans, and there may exist similar compounds in all organisms, making it a highly evolutionarily conserved molecule. Its functions had been found to be important to the control of seasonal reproduction and had influences on the immune and circadian systems. Other papers had found it provided anti-aging and life-prolonging effects as well as protecting DNA from damage from chemical carcinogens. In considering these effects, the authors had noted that if the hormone actually protected cells from damaging oxidative free radicals, then that would explain how it could achieve these additional effects. So they investigated if this was so. To do so, they first needed a setup conditions so that they could measure this effect. They used ultraviolet light to split hydrogen peroxide into two hydroxyl radicals (•OH). Detecting these molecules is very difficult as they'll readily recombine back to peroxide in nanoseconds. So they used a "spin trapping agent" 5,5-dimethylpyrroline N-oxide (DMPO) to give the radicals something to react to and the result of radical-agent reaction could then be detected with an electro-chemical (EC) detector attached to a chromatography (HPLC) system whose results were confirmed using methods from electron spin resonance. The authors continued to describe the methods that they used to ensure that the HPLC-EC method was sensitive to the DMPO-•OH resulting molecule. Once they were assured that they could detect the reaction, then they tried to use this method to investigate melatonin's abilities to preventing the free radical reactions from occurring, and as a comparison, they also used two other well-known free radical scavengers: glutathione and mannitol. They also tested analogues of melatonin, such as 5-methoxytryptamine, which are basically progenitor molecules to melatonin that our bodies make in a series of chemical changes starting from tryptophan. (We get tryptophan from eating turkey meat, oranges or bananas). They ran six tests of different concentrations of each "scavenger chemical" to measure how much they inhibited the DMPO-•OH molecule from forming. 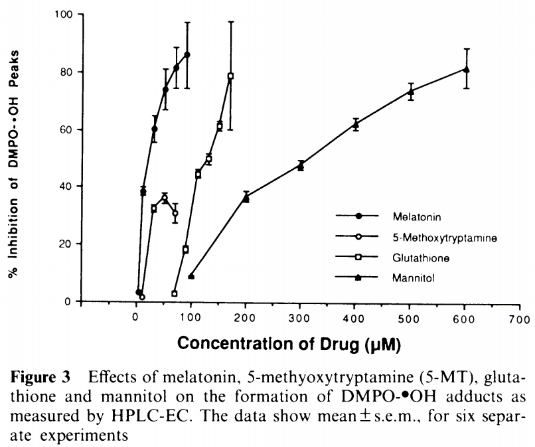 Their figure 3 shows that melatonin provided the highest inhibition of DMPO-•OH reactions at the smallest of concentrations. The hydroxyl radical is the major species mediating oxygen toxicity and with secondary reactive species it generates on lipids, proteins and nucleic acids. These radicals then promote a radical chain reaction that leads to cell degeneration and death. While hydroxyl doesn't commonly occur, once it is, it is hard to get rid of, hence a benefit of melatonin. One the final thoughts the authors posed was that while these experiments showed a great benefit of melatonin in their laboratory settings, it doesn't tell them if melatonin is that good inside living beings. Then again, almost all organisms have antioxidant defences, and melatonin is used from protozoans to humans making it one of the most evolutionary conservative hormone known. There must be something to it.